Building on the success of last year, the SESCU team worked with 10 contenders in the Marathon des Sables, prior to their journey to Morocco. 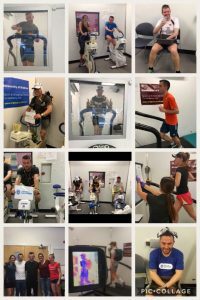 Endurance runners from all over the UK and as far as Switzerland have sought out SESCU’s expertise and facilities to help them prepare for the race. The Marathon des Sables, is an annual 6 day ultramarathon in which competitors travel 251km in the desert heat. Those who attended the labs took part in heat training at 45°C and ~30% relative humidity for up to 5 sessions. Rosa Leftwich and Ash Willmott worked with the runners to test changes in core temperature and heat perceptual response. This training gives them a competitive advantage and prepares and acclimates the body for the desert race. “9 of the 10 runner we worked with completed all the stages of the competition and 6 were within the top 20% of the 1300 competitors. Elisabet Barnes, who Ash worked with, was the 1st female for the second time”. This entry was posted in Consultancy, Heat, Safety, Sport by Neil Maxwell. Bookmark the permalink.